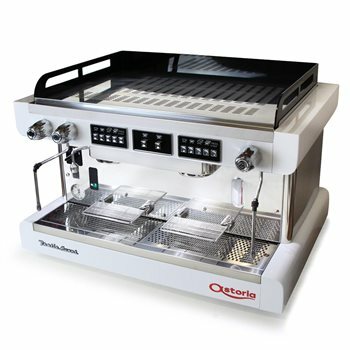 The Astoria Pratic Avant SAE2 automatic features four programmable buttons for volumetric dosing of water for coffee brewing from the group head, an independent manual switch for semi-automatic dispensing, multi-directional stainless steel steam wands and hot water tap. The Pratic is equipped with thermal compensated group heads with preinfusion and heat exchangers. With an LED lit working area The Pratic is the perfect machine for a busy café or restaurant. Includes 1 x White Eureka Zenith 65e On Demand Coffee Grinder and 1 x Stainless Knock Drawer.Heavier duty grinders and a choice of colours are available upon request. Includes basic installation with Water Filter, setup and training on how to use the equipment.